Photo courtesy of View the Vibe. I first spotted the dusky, opaque bottle of 19 Crimes Shiraz on the wine shelf of a friend’s house. It’s branding looked so good I was compelled to ask about it. They loved it — a wine they kept around for an occasion that called for something a little more special than the $10 bottle also on the shelf. I took their recommendation, and picked up a bottle for myself. Typically I’m not tripping over myself to try Aussie Shiraz, even though I’ve had some very good experiences. Instead, I’ll usually go in for an excellent Cab Sauv like Ringbolt. But 19 Crimes surprised me in a very pleasant way, and I’m grateful I was introduced to it. 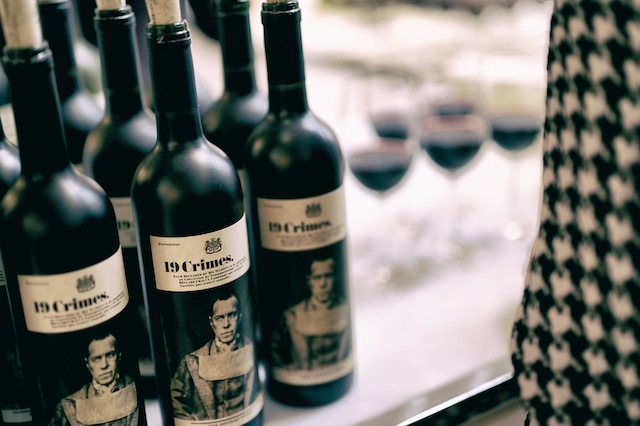 Like most Australian Shiraz wines, 19 Crimes is big on flavour, and small on subtlety. It pours a deep purpley red in the glass, with long slow legs in the glass. Its nose packs big bursts of black pepper, dark cherry and a touch of leather. 19 Crimes is definitely a loud wine, but it doesn’t achieve cacophonous levels. It really comes together on the tongue. 19 Crimes has a luscious, rich texture about it and a body that tends to the heavy side. It’s got a nice acidity to it and solid tannins, but doesn’t force you to pucker up and sip a glass of water immediately like other Shiraz wines. The flavours on the nose are there with the dark cherry and black pepper leading the charge. The leather turns into a bit of tobacco smoke which is nicely complemented by an undertone of dark chocolate. The finish is long and smoky. What makes 19 Crimes so successful is the way it manages it’s flavour. Sure they’re big and bold, but they’re balanced — and that’s the key. I love discovering wine through a good recommendation. 19 Crimes was an excellent one, and I’m happy to have the opportunity to pass it on to you. If you’re looking for the boldness of an Aussie Shiraz with a little more refinement, 19 Crimes is a wine you’re going to enjoy sipping slow.